Two members of a three-man robbery team that has robbed at least nine North Side 7-Eleven stores over the past week are in custody after they struck again in Lincoln Park on Sunday morning. Police said the vehicle used by the offenders was taken in an armed carjacking earlier this month. At 7:10 this morning, three men entered the 7-Eleven at 2004 North Halsted in Lincoln Park and announced a robbery. The clerk was struck in the head by one offender as the team loaded shopping bags with merchandise as well as money from the store’s registers. The offenders then fled westbound in an alley. Less than ten minutes later, police officers checking nearby convenience stores rolled up on the crew’s vehicle as it sat empty behind a 7-Eleven store in the 1300 block of West Fullerton. The robbers were inside the store, battering the clerk as they robbed it for the second time in a week. Officers chased the three offenders on foot and arrested two of them shortly after the second robbery. Charges are pending against both men. Their vehicle was taken in an armed vehicular carjacking at 6 a.m. on Nov. 1st in the 2900 block of North Spaulding, according to a police report. Officers this morning said the car was “filled” with merchandise from various 7-Eleven stores. 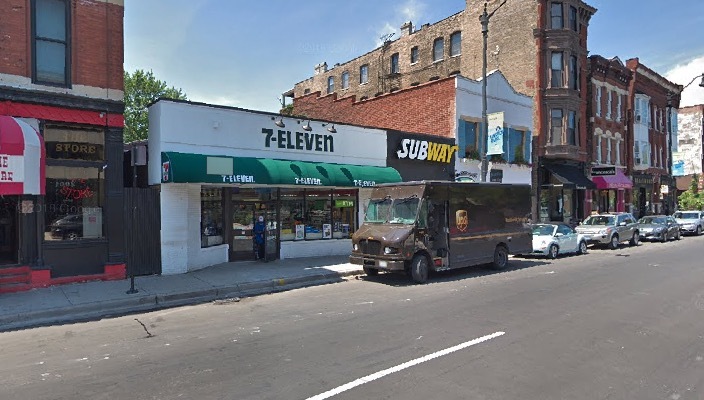 The robbery spree began early last Sunday when the crew struck a 7-Eleven store in the 1500 block of North Damen. Since then, they have robbed a series of 7-Eleven stores across the North Side, forcing clerks to open registers, and battering employees, according to police. CWBChicago will post an updated story when charges are approved.